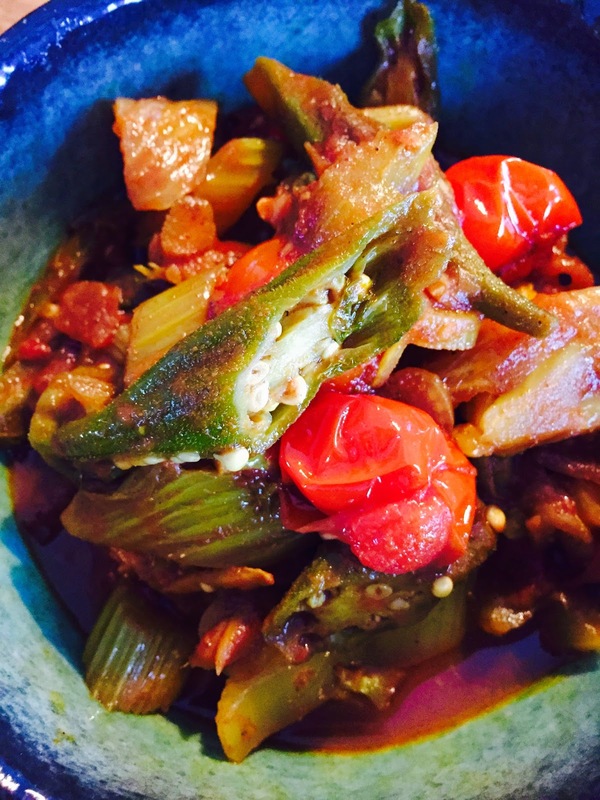 This is a great vegetarian dish which combines the aniseed flavour of fennel with the texture of okra and the citrus tang of tamarind. It takes only minutes to prepare and will be devoured with relish by both carnivores and non carnivores alike! Fry off onion and garlic in a fairly deep saucepan until translucent. Add ginger and powder spices and sautee for about five minutes. Add the chopped fennel, passata and tamarind and mix and cook for a further five minutes. If the mix is too dry and catches add small amounts of water as you cook. Allow to simmer until the fennel has softened. Finally add the okra, tomatoes and sugar and adjust seasoning to taste. Simmer again for a further ten minutes until the the vegetables are cooked but al dente and the tomatoes are still whole but on the verge of bursting open. Do not over stir as this will break up the vegetables. Serve with steamed rice, couscous, chapati or roti.